This is a pleasure to introduce ourselves as a Govt. of India recognized Institution established in the year 2003 for providing quality, quantity, meaningful, valued and recognized Computer Education in trans Hindan area for middle class families, women, professionals, serviceman, students, employed and Unemployed youth of our area and to trained them to acquire Technical Jobs in Pvt. & Public(Govt.) sectors in various IT related jobs to increase self employment and to become a part of “Make in India”. A Grand Foundation of ICT-ITI was Laid & Inaugurated by Late Dr. Sahib Singh Verma, Cabinet Minister of Labour & Employment, Govt. 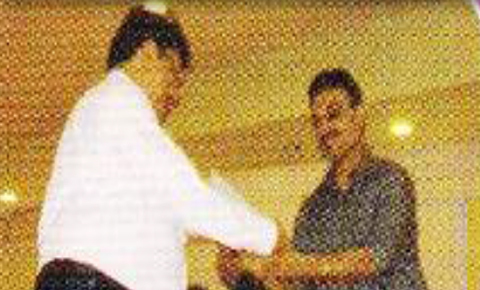 of India & formal Chief Minister of Delhi on 01-04-03. 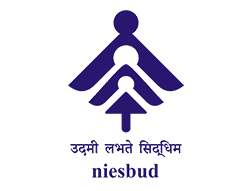 ICT-Industrial Training Institute is accredited by NIESBUD, Ministry of Skill Development & Entrepreneurship Govt. of India. ICT-Industrial Training Institute is a Training Provider of NSDC / Skill India for providing Skill Development courses for untrained /unemployed Youth. 3. 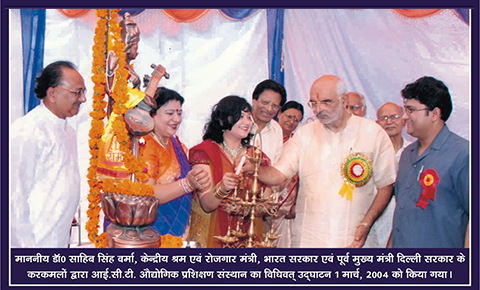 ICT ITI is a prestigious Venture of “Lord Mahavir Educational & Social Society”, registration no-724/2003-04. (under Society Registration Act 1961) and registered under section 12-A & 12AA of the I.T. Act, 1961, also having PAN & TAN Number for smooth functioning of Society/Institution. 1. Deptt. Of Rural Development Govt. 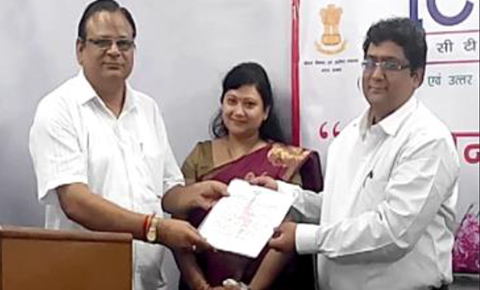 of Utter Pradesh selected ICT ITI for Providing Computer Education to BPL Students under a Scheme of “Swarn Jayanti Gram Swarojgar Yojna 2009”. 2. Air Force Station Hindan Ghaziabad, Deptt. 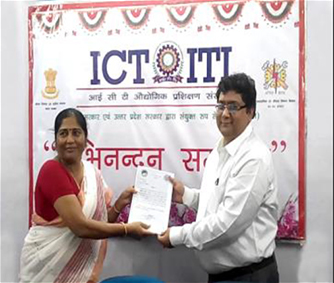 Of Information Technology selected ICT as a Prospective Institute and offered the responsibility to provide computer Training to their highly motivated and efficient work force (i.e. 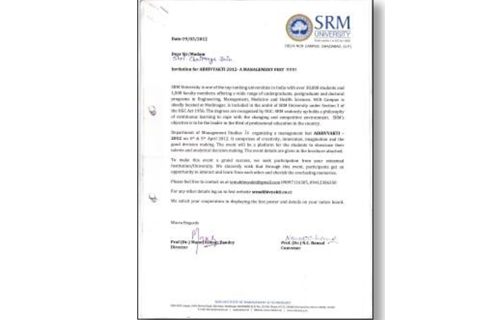 Officers and Air Warriors) in the year 2010 and remarked as one of the best alma mater available for IT Education in the region. Mr. Chaitanya Jain (Principal/Director) ICT ITI Awarded as a “President Award” for meritorious Services to the nation From the President of Republic of India on dated 26/01/2017 , on the occasion of Republic Day. 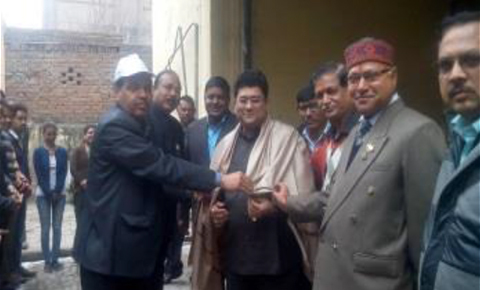 Award of Brand Ambassador from the state of UP. 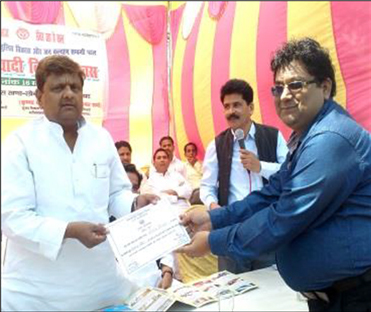 Mr. Chaitanya Jain (Principal/Director) ICT ITI Awarded as a Brand Ambassador of “KAUSHAL VIKAS/ ITI” From the State of UP on dated 15/07/2016 , in the occasion of Kaushal Vikas Diwas organized by Govt. of State of UP . The award has been given by Hon‟ble Cabinet Minister Sh. 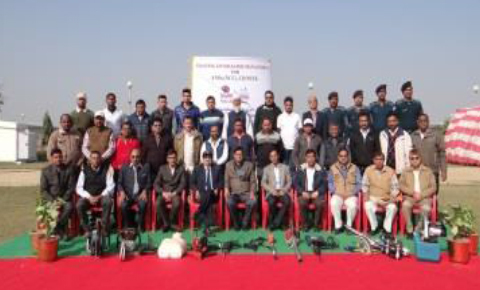 Mahoob Ali ji and Minister of State Prof. Abhishek Mishra ji at Indira Gandhi Pratishthan , Gomti Nager, Lucknow, in the presence of Secretary Kaushal Vikas & ITI , UPSDM and many senior Administration officer from the state of UP. 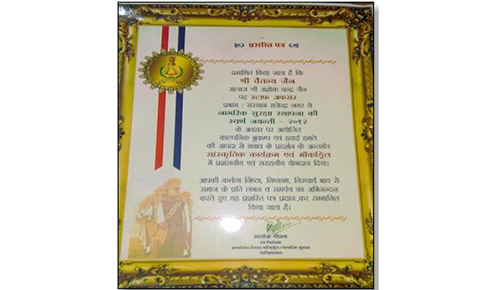 Mr. Chaitanya Jain (Principal/Director) ICT ITI Awarded as a “Viharsh Jain Samaj Ratan ” From the 108 Acharya shiromani /Rashtra Sant Sh. Viharsh Sagar Ji Maharaj on dated 07/03/2017. It was telecasted on Paras Channel Live at , watching time 10:33 to 18:40. Mr. Chaitanya Jain (Principal/Director) ICT ITI Awarded as Best IT Training Institute-2012 by Dr. Sashi Tharoor, Hon‟ble Member of Parliament & Foreign Minister, Govt. Of India. Mr. Chaitanya Jain (Principal/Director) ICT ITI Awarded as an Education Excellence Award-2012 by Dr. Sashi Tharoor , Hon‟ble Member of Parliament & Foreign Minister , Govt. Of India. Mr. Chaitanya Jain (Principal/Director) ICT ITI Awarded as an Excellence in Indian Education Award-2017 by Padma Bhushan Smt. Sharmila Tagore. 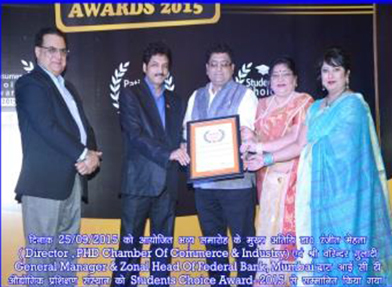 Mr. Chaitanya Jain (Principal/Director) ICT ITI Awarded as Student Choice Award-2015 by Dr. Ranjeet Mehta, Director PHD Chamber of Commerce & Industry (CII)and Mr. Varinder Gulati –General Manager and Zonal Head of Federal Bank, Mumbai for the entire Sahibabad, Gzb Region. 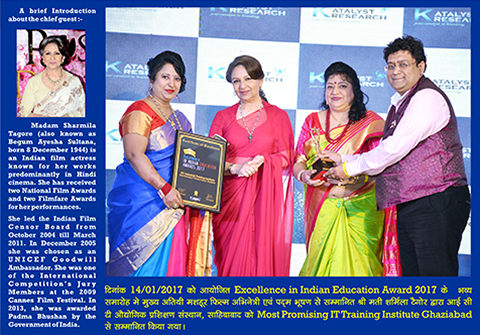 Mr. Chaitanya Jain (Principal/Director) ICT ITI Awarded as Global Quality Award-2015 by Famous Bollywood Actress Ms. Karishma Kapoor Ji in the field of Art, Cultural, Educational & Social Activities. 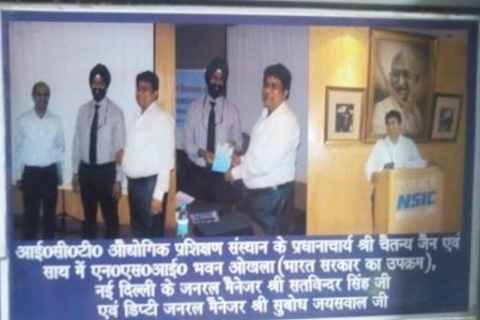 Mr. Chaitanya Jain (Principal/Director) ICT ITI Awarded as Certificate Of Excellence 2015 by Famous Bollywood Actor Sh. 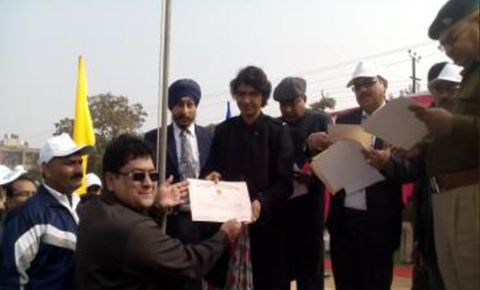 Shekhar Suman Ji in the field of Skill Development & Placement. Mr. Chaitanya Jain (Principal/Director) ICT ITI Awarded as 5 Star Rating Institute by Just Dial.com the India's local and very popular search engine. Dr. Aseem Yadav Ji & Sh. Rakesh yadav ji MLC/Minister of State, UP, Lucknow on dated 16/03/2016 for Skill Development. Madam Raj Devi Choudhary Ji, Hon‟ble Member of State Women Commission, UP, Lucknow on dated 13/09/2015 for the valuable services to their area. 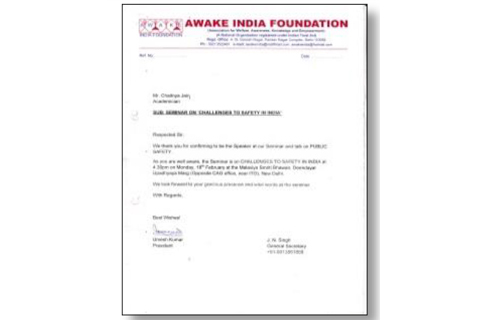 An Appreciation Letter by Sh. Prakesh Javadekar , Hon‟ble Cabinet Minister of HRD, Govt. 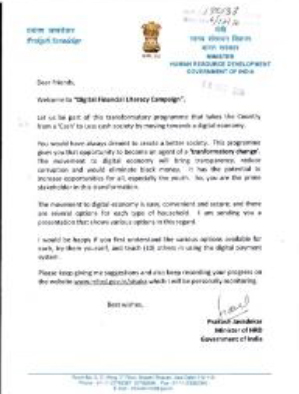 of India for Participating in “Digital Financial Literacy Campaign” on dated 06/12/2016. 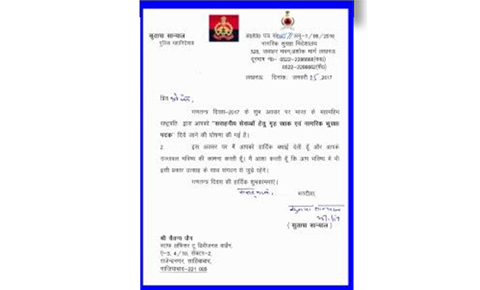 An Appreciation Letter by Madam Sutapa Sanyal, Director General of Police , Uttar Pradesh on dated 25/01/2016 for getting President Award. An Appreciation by Shawl from Madam Nidhi Keservani ji , District Magistrate Ghaziabad on dated 26/01/2017 for getting President Award. An Appreciation by Shawl from Sh. 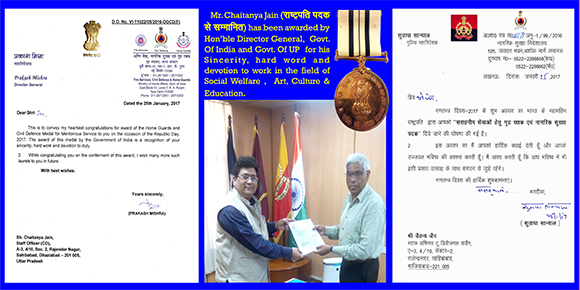 Jaswant Singh Ji , Deputy Controller , Civil Defense , DM Office Gzb on dated 26/01/2017 for getting President Award. Director General of NDRF/CD Sh. R. N. Singh for meritorious services on dated 18/12/2016. 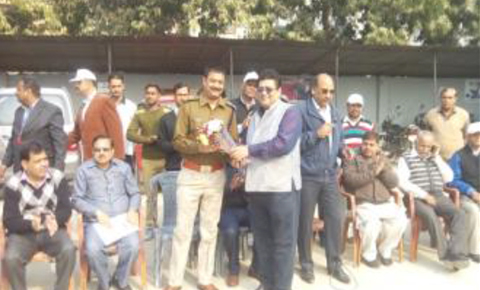 Dr. Praveen Ranjan , SP Crime on dated 8/12/2016 for participating in traffic Control & Awareness Programme. 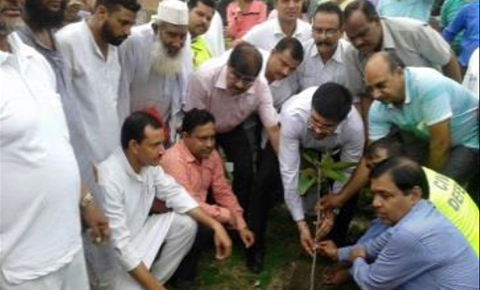 Dr. Nitin Madan OSD- GDA on dated 11/07/16 for Plantation in sahibabad area. 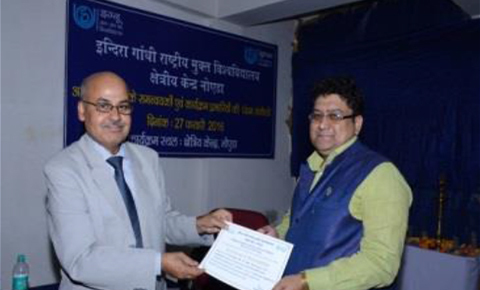 Dr. S. S. Jena (Formal Chairman NIOS), Director IGNOU Regional Center Noida on dated 27/02/2016 for participating in Educational Orientation Programme. Engg. Vipin Kumar Ji , Nodel Officer, Principal Govt. ITI (Women) Gzb and Muradnager on Dated 15 /03/2016 for Skill Development. Hon‟ble ADM City Ghaziabad Madam Priti Jaiswal on dated 17/01/2016 for Social Work. Hon‟ble DM Ghaziabad Sh. 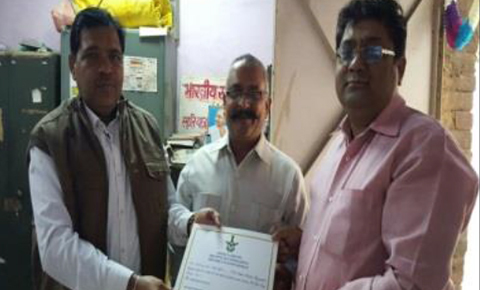 Vimal Kumar Sharma on dated 17/01/2016 for Social Work and on dated 20/08/2015 for Managing Law during Kawar Yatra. Commandant NDRF on dated 17/12/2015 for Participating Disaster Management. Sh. 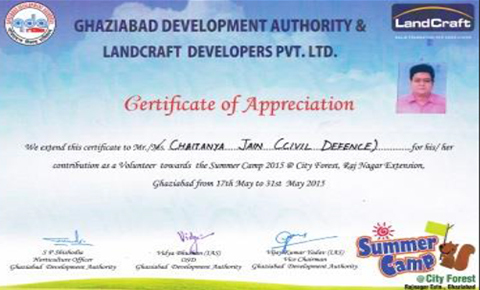 Vijay Kumar Yadav, Vice Chairman , Ghaziabad Development Authority on dated 31/05/2015 for participating in Summer Camp organized by GDA at city Forest. An Appreciation by Sh. Jaswant Singh Ji Deputy Controller, Civil Defense on dated 6/10/2014 for making Peace & Traffic Control on the occasion of Bakrid Festival. An Appreciation by Air Officer Commanding Sh. 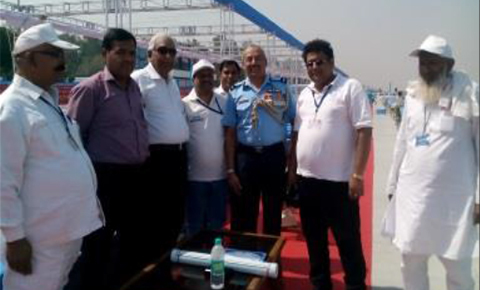 S. Sabharwal, AFS Hindon on Dated 8/10/2015 for making Peace & Traffic Control on the Celebration of Air Force Day. 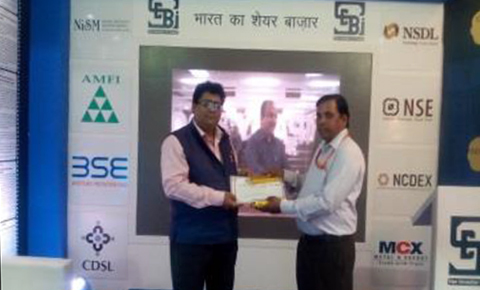 Coordinator- Security Exchange Board of India on Dated 16/Nov/2015 for participating in Financial Literacy Quiz organized at India International Trade Fair. 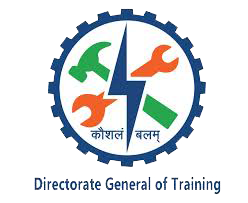 Director General- Civil Defense/NDRF sh. Kamlendra Prasad ji on dated 20/08/2015 for performing social Activities like Fogging, Kawad Yatra , peace & Security at Durga Puja, Ramlila, Plantation, Training Programms, Chatt Pooja, Moorti Visarjan, swatch Bharat Abhiyan. Sh. 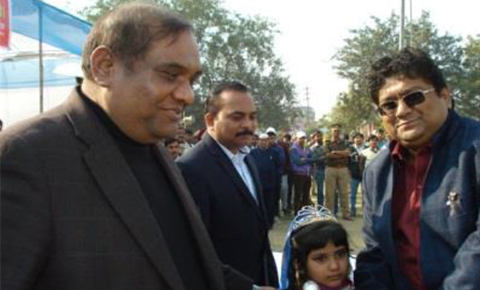 Atal Kumar Rai, ADM City Gzb. 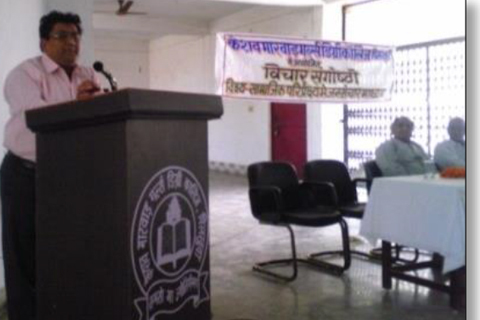 On dated 18/12/2011 for Social work. 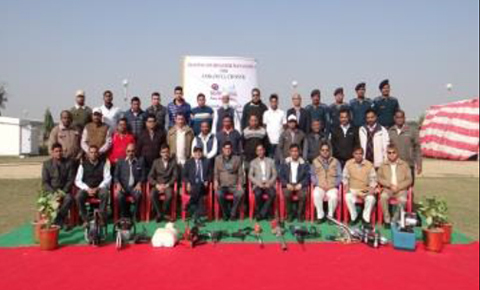 Sh Prashant Kumar Ji , SSP Gzb on dated 23/12/2012 for participating cultural & Mock drill Activities. Mayor Sh. 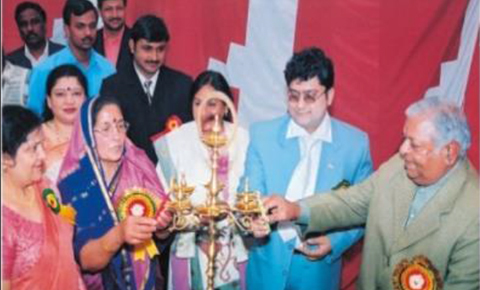 Dinesh Chand Garg on dated 2005 for Cultural Activities. 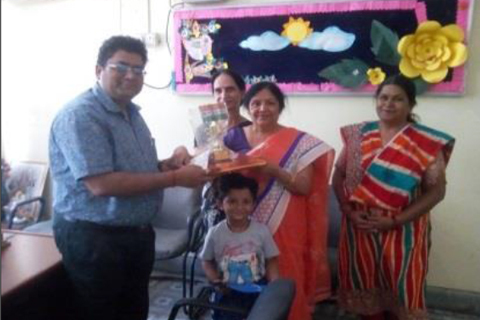 Director Bharat Vikas Parishat sahibabad on dated 2012 for education Sector. Sh S.V. 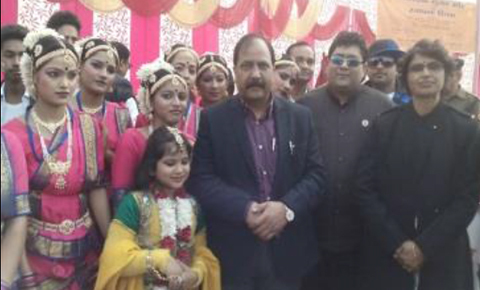 S. Rangarao, District Magistrate Gzb & Sh Brijlal Ji Director General of Police Uttar Pradesh on dated 2013 for art, Culture & Social Work. 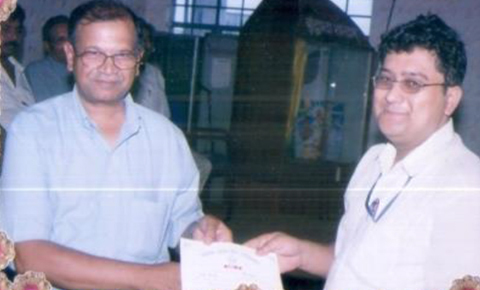 Sh A. K. Jain Divisional Warden Sahibabad on dated 15/08/2012 for valuable services to the nation. Madam Aparna Uphadaya ji District Magistrate, Ghaziabad on dated 17/07/2012 for participating in Kawar Yatra safety & medical Camp . 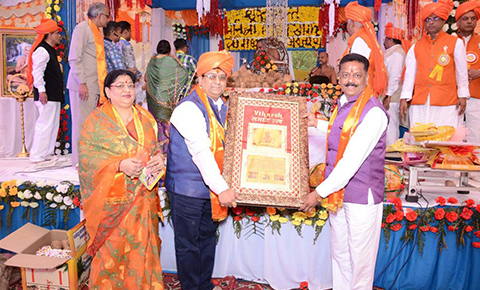 Sh Ashok Gautam ji , Dy. Controller Civil Defense Gzb. 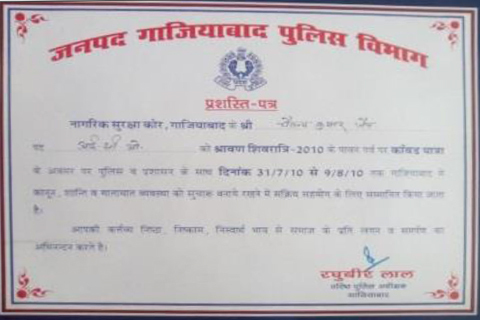 On dated 2012 for Participating in Cultural Activities & Mock Drill. 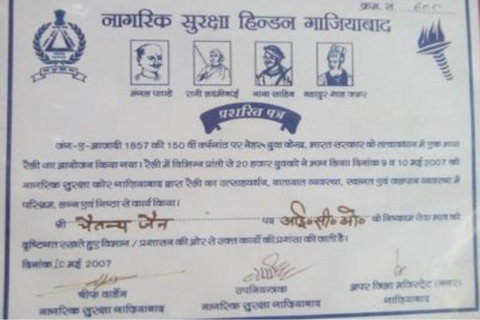 ADM City Gzb on dated 10/05/2007 for participating in 150th anniversary of 1857 war for independence. 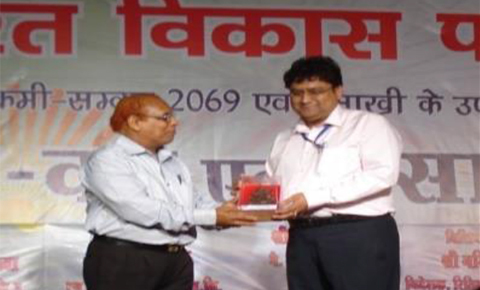 Dr. Prof. Manoj Kumar Pandey, SRM University, Delhi NCR Campus, Gzb UP on dated 05/04/2012 for participating as a Judge in Web Site development Competition under Abhivyakti – Management Fest 2012. Sh Umesh Kumar ji, President –Awake India Foundation on dated 18/02/2013 for Participating in a Seminor on “Challenges to Safety in India “ organized at Malaviya Smriti Bhawan, Deen Dayal Upadhyaya Mark, New Delhi. Ms. S.S.Jain Principal Siddharth International Public School on Dated 27/02/2017 for addressing their Board Students for their bright future through audio conferencing. 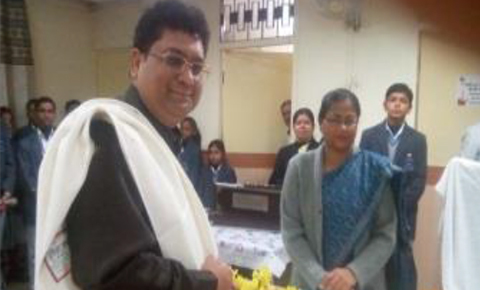 Dr. Nitin Madan , SDM Gzb. 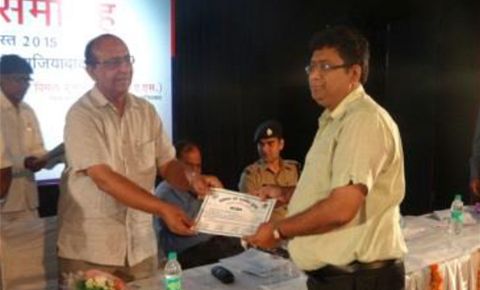 On dated12/09/2013 for successful distribution of Laptop under Free Laptop Distribution Scheme conducted by the Govt. of UP under the Supervision of Hon‟ble Chief Minister of UP. 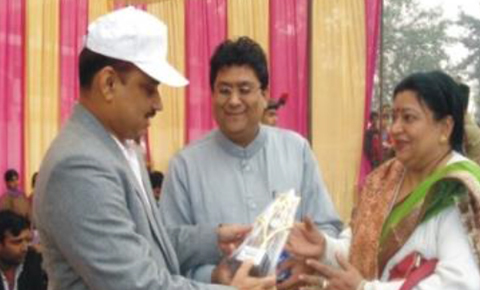 Sh Raghubeer Lal Ji, SSP Gzb. On dated 9/8/2010 for Peacefully organized Kawar yatra from Mohan Nager to Delhi. Sh. Satvinder Singh Ji –General Manager, NSIC under MSME, Govt. 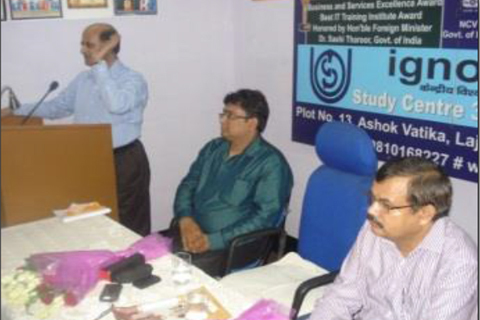 of India on 2010 for participating seminar on entrepreneurship/ Incubation Development Programme. Forest Deptt. 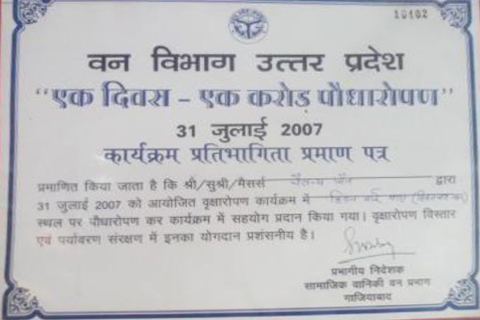 Gzb on dated 31/07/2007 for participating in “One Day One Crore Plantation ” at Gzb. Dr. 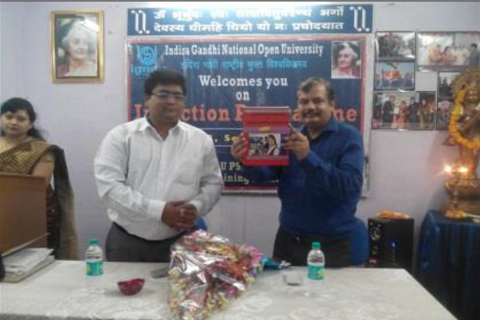 A.M. shaklani (Dy Director IGNOU , Regional Center Noida ) Inaugurate the Book for ITI Polytechnic Students i.e “Computer Operator & Programming Assistant” based on NIMI/DGET Pattern and published by “Abhishek Publication New Delhi & Chandigarh with ISBN No-978-81-8247-486-4 , co-written by Mr. Chaitanya Jain . Other many meritorious awards/Certificates for Art, Culture, Education & Social Work etc.